Do you like movies? How about side-scrolling, daredevil action? If you answered “yes” to these questions, you might want to check out Joe Danger 2: The Movie on the PlayStation Vita. Like its prequel, Joe Danger, which received high praise from PlayStation LifeStyle, Joe Danger 2 puts the player is the shoes of an Evel Knievel wannabe as he tries to zip through a number of levels in a race to the finish line. Besides trying to get to the finish line as fast as possible, players must also collect little stars and perform tricks to maximize the number of points they receive at the end of each level. Doing things like collecting certain objects or beating a certain time gives players special stars, which are used to unlock new movie sets. Each movie set is fairly unique — there is an Indiana Jones themed set, a robot themed set, a set that is supposed to represent a winter environment, and so on. The sets contain a few levels each, and besides allowing players to enjoy a change in scenery, they also allow players to use unique vehicles that correspond to the sets’ themes. 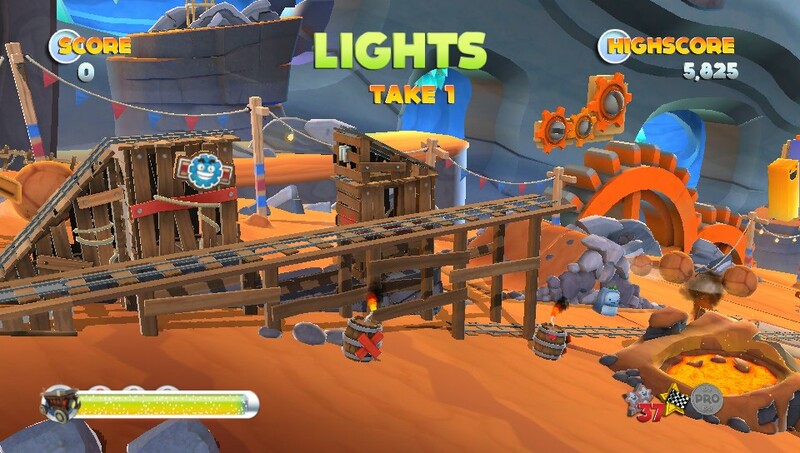 Unlike its prequel, Joe Danger 2 lets players try to whiz through levels and perform stunts on a large amount of different vehicles. There are snowmobiles in the winter levels, minecarts in the Indiana Jones levels, motorcycles in the city levels, and a number of other fun means of transportation scattered throughout the game. At one point, I was attempting to ride a unicycle through the jungle, trying to balance, perform tricks, and jump over various traps as I pedaled furiously towards the finish line. Speaking of traps, there are a whole lot of them in Joe Danger 2. Road spikes, bombs, missiles — these are things that players need to either jump over or duck under in order to complete certain levels. One little trap can make you restart the entire level, and although each level is only a minute or so long, it can still be very annoying to have to repeat the same level over and over and over again. It’s especially annoying when a trap seemingly appears out of nowhere, which happened to me a number of times on a couple of levels. It isn’t that the traps are purposefully designed to be hidden — most are actually out in the open. Instead, it is that the backgrounds are simply too busy at times. A lot of times while you are busily and frantically trying to make it past some difficult part in the level, robots will be running around in the background, or maybe helicopters will be flying overhead. These are fun animations that seek to keep to levels and environments fresh, but these can easily distract players from what’s going on around them. However, if the backgrounds are a bit overwhelming for you, you can always make your own levels in the Movie Maker mode. Here, players can use a variety of different objects, traps, and more to create their own, unique levels to play through. I got caught up with all the different customizations available that I spent a good 40 minutes on one tiny level after promising myself I would only spend 10 minutes on it. The only downside is that there doesn’t seem to be a way to share your levels on the PS Vita version of Joe Danger 2, which limits the amount of fun you can have with the feature. There are, however, a number of different costumes that you can dress your character up in, such as making him look like LittleBigPlaner’s Sackboy or a person from Minecraft, which somewhat makes up from the lack of level sharing. Besides not being able to share levels and the somewhat overwhelming backgrounds, Joe Danger 2: The Movie is a fun and addicting game that easily lives up to the energy of its prequel. Movie buffs, casual gamers, and fans of platformers should all pick up a copy of Joe Danger 2 — you won’t regret it.